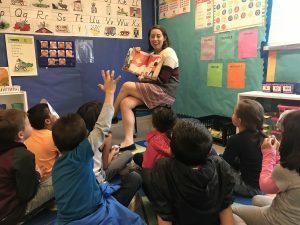 Teach for America Corps member Eleah Maxfield shares how she celebrated Read for the Record and the power of bilingual learning in her kindergarten classroom in Basin City, WA with this year’s book Maybe Something Beautiful. “Ummm, quizás…maybe…” thinks Mira, the main character in the heart-warming children’s book Quizás algo Hermoso (Maybe Something Beautiful), co-authored by F. Isabel Campoy and Theresa Howell. Mira is thinking about how she can use her paintbrush and color, along with her creative spirit, to transform the neighborhood around her. 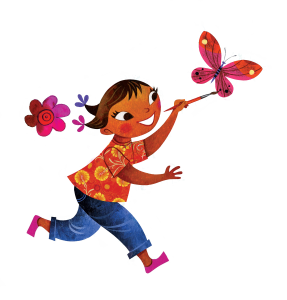 As shown through Rafael López’s beautiful illustrations, Mira creates a world full of rainbows and life, as she spreads her love throughout her community with the help of a muralist friend. Just as Mira’s paintings proved transformational to her community, Quizás algo Hermoso was transformational for my students. As a teacher in a low-income, rural, predominately Latinx small town, I have struggled with subverting the narrative that English is the language of power in my classroom. My own efforts to study Spanish and incorporate it into our daily routines have not been enough to instill in my students the belief that speaking Spanish is not only a skill but something of which we should be proud. It took two pages of Quizás algo Hermoso for the tables to be completely turned in our classroom. Suddenly, my native Spanish speakers were the experts and we were all learning the colors of the rainbow together…in Spanish. As we turned the pages with Mira, my native English speakers began to proudly blurt out the Spanish words that they knew, eager to show their skills. Out of nowhere, my students, both English-speaking and Spanish-speaking, were proud of the Spanish language skills they had, no matter how much or how little. To say that this was ground breaking is an understatement. Our school culture is one where the majority of the students identify as Latinx, but only two of the teachers identify the same. English is the language of power and authority in our school hallways, and it is the one of the greatest hopes from my Spanish-speaking parents that their children learn to speak English fluently. When we engaged with Quizás algo Hermoso, my students’ home language was validated and all of my students saw the power of being able to speak in more than one language. Validating both English and Spanish in the classroom opened the door for community learning, with my English-speakers learning from my Spanish-speakers and vice-versa. Bilingual education in the classroom allows for cross-community learning experiences, helping bridge a gap in my classroom between those who felt empowered to speak and those who did not. As an educator, I believe my classroom’s experience with Quizás algo Hermoso demonstrates the power of bilingual education. Speaking personally, I grew up a half-Mexican/half-White learner in Texas and was never taught how to speak Spanish. How isolated I felt from the other students who identified as Mexican and how frustrated I was when my friends wanted me to prove my heritage by speaking Spanish! I can only imagine how proud and excited I would have felt to be learning Spanish in my own elementary classroom, and how eager I would have been to share my skills with my mom and grandma. It is my hope for my students that we continue to grow and learn together-in English and in Spanish. To me, to create something beautiful with my students would mean creating a space where diversity and inclusion is celebrated and we are all proud of our different skills. In this space, my students can be empowered to use their big, beautiful brains to say “Ummm, quizás…” just like Mira.